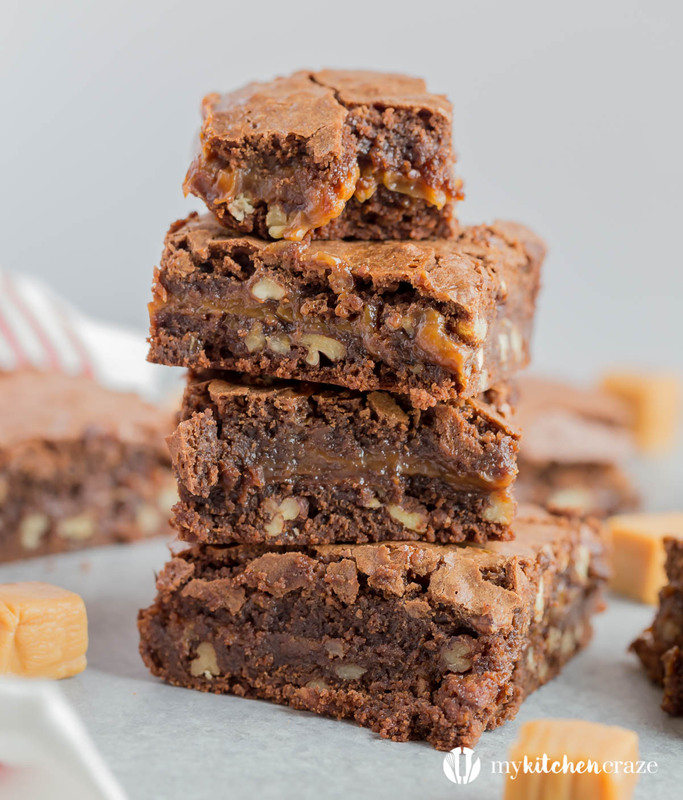 If you love brownies then you’re gonna love these Caramel Pecan Brownies. They’re soft, chewy, chocolate-y with caramel and pecans. Add a dollop of vanilla ice cream and you’re in brownie heaven. I was in a baking mood this past week and really wanted to make something chocolate-y. I decided to go on a google hunt. Wow! Seriously you guys, there are so many yummy ideas on google. I could spend all day just looking around and pinning lots and lots of recipes and DIY projects. So many fun things! If you’re on Pinterest, be sure to follow me here for all of My Kitchen Craze recipes and more!! While I was looking for some inspiration, I saw a bunch of brownie recipes. That’s when I got an idea. What about putting some caramel and pecans into the brownies? Yum! Who doesn’t love caramel and pecans? I’m a brownie/bar kinda of girl all the way, so this was the perfect idea. I’d pick a brownie and bar recipes over any dessert. 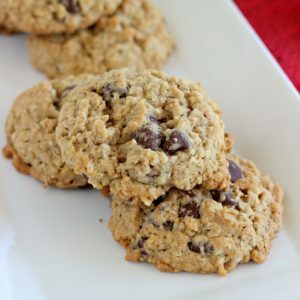 I love how easy they are to make and they always taste delicious! Plus they’re super simple to eat and clean up is a breeze. I used my easy go to brownie recipe, cooked half of the batter in a baking dish, then smothered melted caramel bits and pecans all over, then put the rest of the brownie batter on top and finished baking them. I crossed my fingers that they would be amazing, but I didn’t realize how good they actually would be. 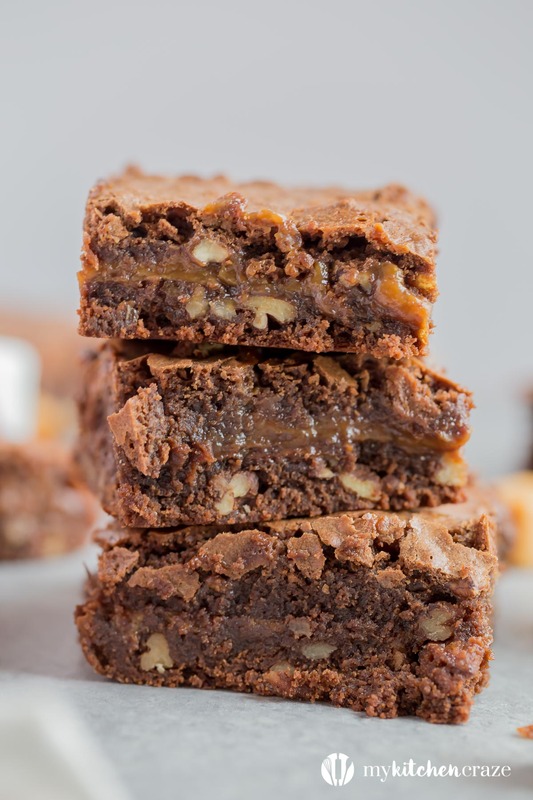 You guys, these Caramel Pecan Brownies are soft with crunchy pecans and edges (I love the crunchy edges, don’t you?). They have the right about of chocolate, pecans and caramel to make them irresistible. Beware you will want more than one. And you will want ice cream or a glass of milk with it. Be prepared to have your mind blown. No joke. These are one the best brownies I’ve had in a long time. You’re going to have to trust me and make them asap! Preheat oven to 350 degrees F. Line a 9x13 baking dish with foil and spray with cooking spray; set aside. Microwave chocolate and butter in a large bowl for 2 minutes, or until butter is melted. Stir until chocolate is fully melted and incorporated with butter. Add sugar, eggs and mix well. Stir in flour until blended. Stir in pecans. Pour half of brownie batter into prepared baking dish. Bake 20 minutes, or until top is firm to the touch. About 5 minutes before the brownies are set, place caramel and whipping cream in a medium bowl. Microwave for 2 minutes; or until caramel start to melt. Stir until caramel is completely melted. Pour caramel mixture over brownie batter in prepared pan, making sure to get all the edges. Pour remaining uncooked brownie batter on top of the caramel. Bake 26-30 minutes; or until toothpick inserted comes out clean and is firm to the touch. Cool completely, then remove foil and cut into squares. Enjoy with some ice cream or a nice glass of milk! These brownies look so decadent and delicious! I am a huge fan of caramel and chocolate. And the pecans mixed in adds a nice texture contrast! Swoon! These brownies look amazing, Cyndi! 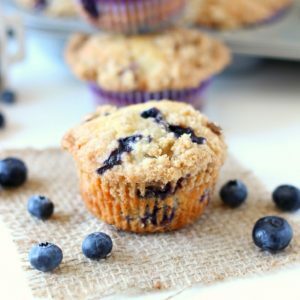 I could seriously go for a plate of these for breakfast! 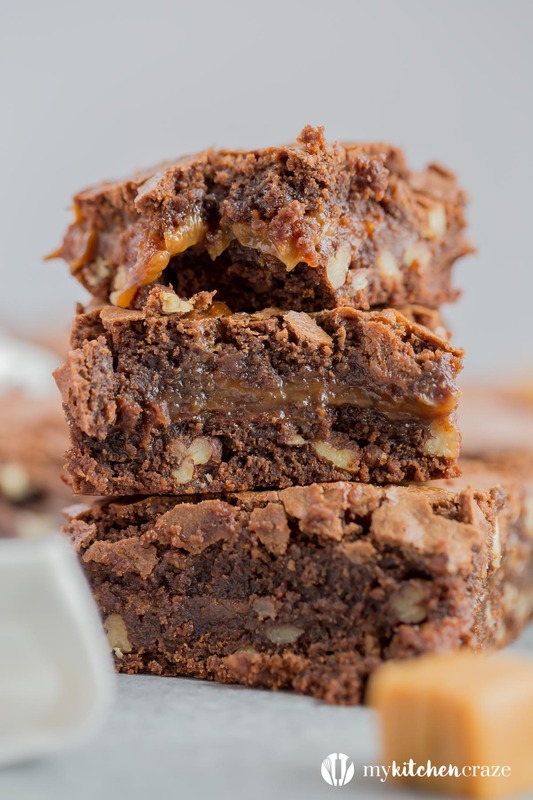 Caramel brownies are my favorite and I love the addition of pecans! Definitely the perfect sweet treat! Pinned! These are totally dreamy! Pinned! These are the perfect brownies! 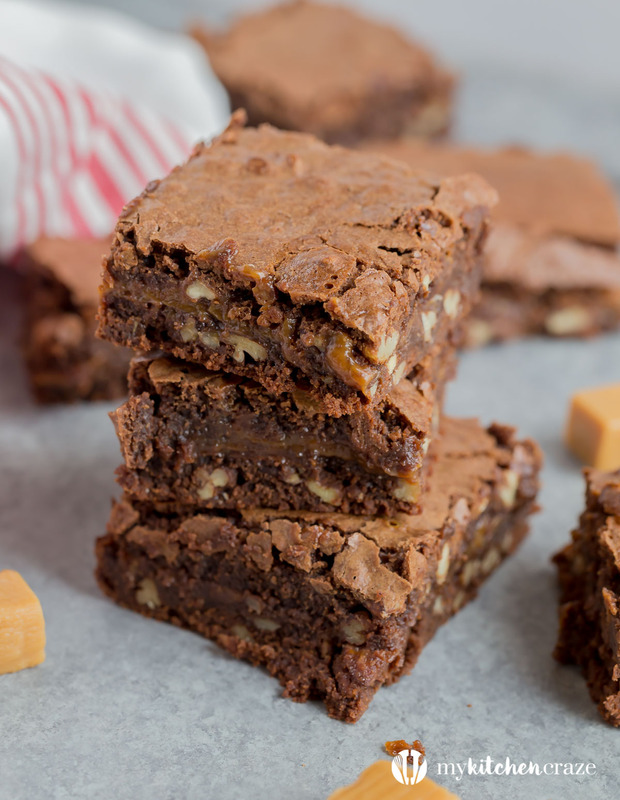 Okay, so I think pretty much every brownie is perfect, but these are seriously amazing! Love that caramel filling! Thank you Ashley! Knew there was a reason I liked you…we both love brownies. Yum! I only go to pinterest if I really have a specific ingredient.. otherwise…. oh wow… I get overwhelmed. 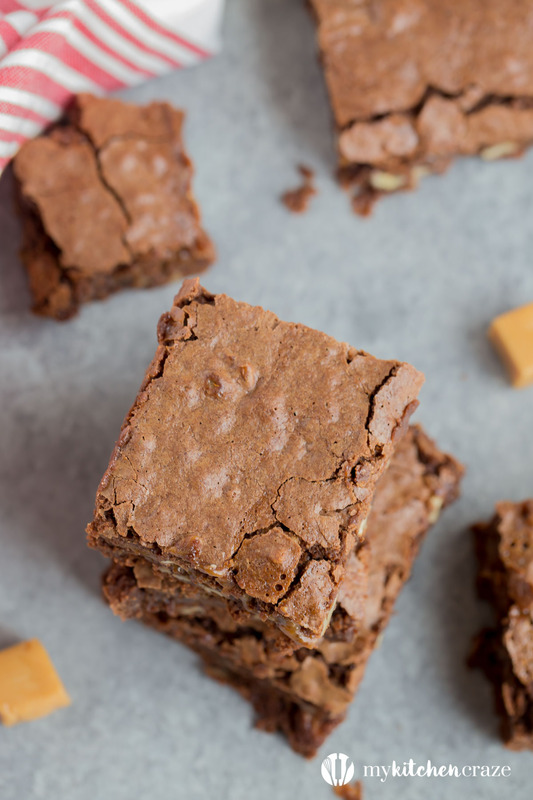 BUT these brownies look like a perfect post pinning munchie! I totally feel yea Kita! I always end up hungry and wanting all kinds of foods. Its just so fun. Thanks for pinning! Thank you Medha! Gotta love Pinterest! Oh my goodness, caramel and pecan is such a perfect combination. Pinned! Couldn’t agree more Mariah! Thank you! These look like the perfect brownie! 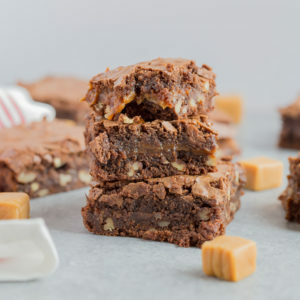 Perfectly fudgy and chewy! These look to die for! All the caramel and pecans…yum! I’m going to have to try this soon…I have yet to find a from scratch brownie recipe I love. 🙂 Pinned! These brownies look insanely good Cyndi! Pinned!